The new Yate Spur cycle path opened in April 2018 providing a shared use route between the Bristol and Bath railway path at Coxgrove Hill and Station Road, Yate. BCyC has been pressing for this for many years and it formed part of the Strategic Cycle Network we proposed in 2013 so it’s great to have it in place. Have you used it yet? 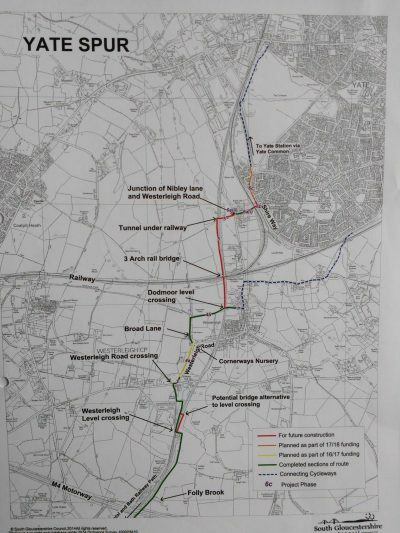 BCyC members have been active in the Yate Joint Cycleways Group which has been a strong advocate for the Spur, and for the other links and routes that Yate needs. There is a meeting of the JCG on Tuesday 17th July at Town Council Offices, Poole Court, Yate to plan for the next stage. Ideas and actions will be taken forward through the South Gloucestershire Cycle Forum. Our diary page has further details of this meeting as well other meetings and rides.